Teachers Take Care of Students. Who Takes Care of the Teachers? School policies must be in place to ensure teachers receive enough training and support to remain resilient, says Leora Wolf-Prusan. Can Poetry Revolutionize the Parent-Teacher Conference? Teachers engage family members in their students' learning to encourage support at home. Guidelines on implementing the Next Generation Science Standards, which focus on hands-on activities, are unveiled. 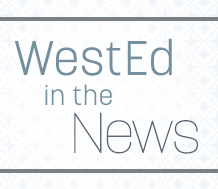 WestEd's Academic Parent-Teacher Teams approach begins to take hold in New York City schools. A California advisory group will recommend ways to make measuring school climate more meaningful for school districts. New book from WestEd authors encourages teachers to learn and model "expert" reading strategies. Choosing from among donated books, young students who spend lots of time online can improve their reading skills.